Edie Falco was born in Brooklyn, and started appearing in school plays almost as soon as she started going to school. Falco had a fairly substantial role in her first film, Sweet Lorraine with Maureen Stapleton and Giancarlo Esposito. She attended college with eventual independent filmmaker Hal Hartley, and has appeared in three of his films. She has also made two films with Abel Ferrara, and had a tiny role in Woody Allen's Bullets Over Broadway. She had a rare leading role in Judy Berlin, an oddball but endearing independent movie about an eclipse over Long Island. She is best known for playing Carmela, Mafia don Tony Soprano's long-suffering wife on The Sopranos. 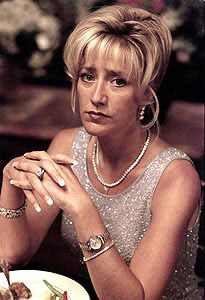 Falco was the first actress to sweep all three major TV awards for the same role in the same year, winning the Emmy, Screen Actors Guild, and Golden Globe Awards in 1999 for The Sopranos. She has also played a cop's wife on Homicide: Life on the Street, a defense attorney on Law & Order, and a prison guard on Oz. She has survived breast cancer, and is a recovering alcoholic, sober since the early 1990s. Her uncle is novelist Edward Falco, author of Acid and Sabbath Night in the Church of the Piranha.